"4H" redirects here. For other uses, see 4H (disambiguation). 4-H is a U.S.-based network of youth organizations whose mission is "engaging youth to reach their fullest potential while advancing the field of youth development". Its name is a reference to the occurrence of the initial letter H four times in the organization's original motto ‘head, heart, hands, and health’ which was later incorporated into the fuller pledge officially adopted in 1927. In the United States, the organization is administered by the National Institute of Food and Agriculture of the United States Department of Agriculture (USDA). 4-H Canada is an independent non-profit organization overseeing the operation of branches throughout Canada. Throughout the world, 4-H organizations exist in over 50 countries; the organization and administration varies from country to country. Each of these programs operates independently but cooperatively through international exchanges, global education programs, and communications. "Engaging youth to reach their fullest potential while advancing the field of youth development." The goal of 4-H is to develop citizenship, leadership, responsibility and life skills of youth through experiential learning programs and a positive youth development approach. Though typically thought of as an agriculturally focused organization as a result of its history, 4-H today focuses on citizenship, healthy living, science, engineering, and technology programs. Clubs in today’s 4-H world consist of a wide range of options each allowing for personal growth and career success. The 4-H motto is "To make the best better", while its slogan is "Learn by doing" (sometimes written as "Learn to do by doing"). As of 2016, the organization had nearly 6 million active participants and more than 25 million alumni. The foundations of 4-H began in 1902 with the work of several people in different parts of the United States. The focal point of 4-H has been the idea of practical and hands-on learning, which came from the desire to make public school education more connected to rural life. Early programs incorporated both public and private resources. 4-H was founded with the purpose of instructing rural youth in improved farming and farm-homemaking practices. By the 1970s, it was broadening its goals to cover a full range of youth, including minorities, and a wide range of life experiences. 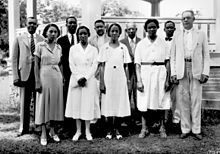 During this time researchers at experiment stations of the land-grant universities and USDA saw that adults in the farming community did not readily accept new agricultural discoveries, but educators found that youth would experiment with these new ideas and then share their experiences and successes with the adults. So rural youth programs became a way to introduce new agriculture technology to the adults. Club work began wherever a public-spirited person did something to give rural children respect for themselves and their ways of life and it is very difficult to credit one sole individual. Instances of work with rural boys and girls can be found all throughout the 19th century. In the spring of 1882, Delaware College announced a statewide corn contest for boys, in which each boy was to plant a quarter of an acre, according to instructions sent out from the college, and cash prizes, certificates, and subscriptions to the American Agriculturalist were rewarded. In 1892, in an effort to improve the Kewaunee County Fair, Ransom Asa Moore, President of the Kewaunee Fair, the Agricultural Society, and Superintendent of the Kewaunee County Schools in Wisconsin, organized a "youth movement", which he called "Young People's Contest Clubs", in which he solicited the support of 6,000 young farm folks to produce and exhibit fruits, vegetables, and livestock. The fairs were very successful. In 1904, while working for the University of Wisconsin–Madison and trying to repeat what he had successfully accomplished in Kewaunee County over a decade before but with different intentions, "Daddy" R.A. Moore convinced R.H. Burns, then Superintendent of Schools of Richland County, Wisconsin, to have the Richland County Boys and Girls organize and assist in a corn-project activity to help market and distribute improved seeds to the farmers in the state of Wisconsin (and beyond). A. B. Graham started one of the youth programs in Clark County, Ohio, in 1902, which is also considered one of the births of the 4-H program in the United States. The first club was called "The Tomato Club" or the "Corn Growing Club". T.A. "Dad" Erickson of Douglas County, Minnesota, started local agricultural after-school clubs and fairs also in 1902. Jessie Field Shambaugh developed the clover pin with an H on each leaf in 1910, and, by 1912, they were called 4-H clubs. Early 4-H programs in Colorado began with youth instruction offered by college agricultural agents as early as 1910, as part of the outreach mission of the Colorado land grant institutions. The national 4-H organization was formed in 1914, when the United States Congress created the Cooperative Extension Service of the USDA by passage of the Smith-Lever Act of 1914, it included within the CES charter the work of various boys' and girls' clubs involved with agriculture, home economics and related subjects. The Smith-Lever Act formalized the 4-H programs and clubs that began in the midwestern region of the United States. Although different activities were emphasized for boys and girls, 4-H was one of the first youth organizations to give equal attention to both genders (cf., erstwhile Boys Clubs of America). The first appearance of the term "4-H Club" in a federal document was in "Organization and Results of Boys' and Girls' Club Work," by Oscar Herman Benson (1875–1951) and Gertrude L. Warren, in 1920. By 1924, these clubs became organized as 4-H clubs, and the clover emblem was adopted. Warren expanded the scope of girls' activities under the program (promoting garment making, room decorating, and hot lunches), and wrote extensive training materials. The first 4-H camp was held in Randolph County, West Virginia. Originally, these camps were for what was referred to as "Corn Clubs". Campers slept in corn fields, in tents, only to wake up and work almost the entirety of each day. Superintendent of schools G. C. Adams began a boys' corn club in Newton County, Georgia, in 1904. 4-H membership hit an all-time high in 1974 as a result of its popular educational program about nutrition, Mulligan Stew, shown in schools and on television across the country. Today, 4-H clubs and activities are no longer focused primarily on agricultural activities, instead emphasizing personal growth and preparation for lifelong learning. Participation is greatest during the elementary school years, with enrollment in programs and activities peaking in the 4th grade. In the southern United States, in the mid-1960s 4-H began to broaden its programming to cover life experiences unrelated to agriculture. It merged its segregated African American and white programs, but full-fledged integration proved elusive. 4-H was successful in removing gender-based restrictions on participation. Past Honorary Chairmen of Council have included U.S. Presidents Calvin Coolidge, Herbert Hoover, Franklin D. Roosevelt, Harry Truman, Dwight Eisenhower, John F. Kennedy, Lyndon B. Johnson, Richard Nixon, Jimmy Carter, Ronald Reagan, George H.W. Bush, and Bill Clinton. The original pledge was written by Otis E. Hall of Kansas in 1918. Some California 4-H clubs add either "As a true 4-H member" or "As a loyal 4-H member" at the beginning of the pledge. Minnesota and Maine 4-H clubs add "for my family" to the last line of the pledge. Originally, the pledge ended in "and my country". In 1973, "and my world" was added. It is a common practice to involve hand motions to accompany these spoken words. While reciting the first line of the pledge, the speaker will point to their head with both of their hands. As the speaker recites the second line, they will place their right hand over their heart, much like during the Pledge of Allegiance. For the third line, the speaker will present their hands, palm side up, before them. For the fourth line, the speaker will motion to their body down their sides. And for the final line, the speaker will usually place their right hand out for club, left hand for community, bring them together for country, and then bring their hands upwards in a circle for world. The 4-H name and emblem have U.S. federal protection, under federal code 18 U.S.C. 707. This federal protection makes it a mark unto and of itself with protection that supersedes the limited authorities of both a trademark and a copyright. The Secretary of Agriculture is given responsibility and stewardship for the 4-H name and emblem, at the direct request of the U.S. Congress. These protections place the 4-H emblem in a unique category of protected emblems, along with the U.S. Presidential Seal, Red Cross, Smokey Bear and the Olympic rings. Through the program's tie to land-grant institutions of higher education, 4-H academic staff are responsible for advancing the field of youth development. Professional academic staff are committed to innovation, the creation of new knowledge, and the dissemination of new forms of program practice and research on topics like University of California's study of thriving in young people. Youth development research is undertaken in a variety of forms including program evaluation, applied research, and introduction of new programs. Volunteer leaders play a major role in 4-H programs and are the heart and soul of 4-H. They perform a variety of roles, functions and tasks to coordinate the 4-H program at the county level and come from all walks of life, bringing varied and rich experiences to the 4-H program. With over 540,000 volunteers nationally, these leaders play an essential role in the delivery of 4-H programs and provide learning opportunities to promote positive youth development. Every year, volunteer leaders work to carry out 4-H youth development programs, project groups, camps, conferences, animal shows and many more 4-H related activities and events. 4-H volunteer leaders help youth to achieve greater self-confidence and self-responsibility, learn new skills and build relationships with others that will last a lifetime. Volunteers serve in many diverse roles. Some are project leaders who teach youth skills and knowledge in an area of interest. Others are unit or community club leaders who organize clubs meetings and other programs. Resource leaders are available to provide information and expertise. 4-H volunteers work under the direction of professional staff to plan and conduct activities and events, develop and maintain educational programs, and secure resources in support of the program. Offers youth a safe, healthy, caring and enriching environment. Engages youth in long-term, structured learning in partnership with adults. Addresses the interests of youth and their physical, cognitive, social and emotional needs. 4-H Afterschool programs utilize experimental and cooperative learning activities and provide interaction with competent adults. Results of retrospective pre/post-surveys indicate that children enrolled in the program showed life skill gain over time, and that gains on specific life skills differed as a function of age, gender, and ethnicity. The life skills gained through 4-H Afterschool give children the tools they need for perceiving and responding to diverse life situations and achieving their personal goals. Participation in these quality programs which use experiential and cooperative learning have all been found to contribute to children's social development and academic success. Each state runs its own camping program. The first state 4-H camp was held at Jackson's Mill outside of Weston in Lewis County, West Virginia. 4-H camping programs in most states are run through land-grant institutions, such as Washington State University, which runs the Washington program, and Pennsylvania State University runs Pennsylvania's. The Georgia 4-H camping program has the largest youth center in the world, called Rock Eagle. The first 4-H camp was held at Camp Good Luck in Randolph County, West Virginia. Some states offer programs for youth in grades K-3 called Cloverbuds, Cloverkids, 4H Adventurers, Primary Members, or Mini 4-H. Most states prohibit this age group from competition due to research in child development demonstrating that competition is unhealthy for youth ages five to eight. Many colleges and universities have collegiate 4-H clubs. Usually members are students who are 4-H alumni and want to continue a connection to 4-H, but any interested students are welcome. Clubs provide service and support to their local and state 4-H programs, such as serving as judges and conducting training workshops. They are also a service and social group for campus students. The very first collegiate 4-H club started in 1916 on the Oklahoma State University - Stillwater campus. Finding its roots in the early 4-H movement in West Virginia, the 4-H All-Star program strives to recognize and challenge 4-H members and volunteers. State 4-H Club Leader William H. "Teepi" Kendrick sought to develop youth to "be yourself at your best" and to "make the best better" through a fourfold personal development pattern involving the head, hands, heart, and, at that time, hustle. It was with this philosophy, in collaboration with others, that the 4-H emblem was born. In an attempt to harbor further individual growth, Kendrick recognized excellence with pins bearing one, two, three, and four H's. Recognition for outstanding participation was rewarded from 1917 to 1921 with trips to a Prize Winner's Course at West Virginia University. Members who demonstrated outstanding qualities at these courses were awarded five-pointed red pins with five H's, with this additional H to symbolize honor. The recipients of these pins were referred to by Kendrick as "All Stars". It was following the pin consecration ceremony in 1919 that the official West Virginia 4-H All Stars organization was chartered, becoming the Alpha Chapter of the nationwide 4-H honorary. Many states have All Star programs, although All Star programs vary from state to state. Selection as a 4-H All Star is a recognition of achievement. In California, for example, it is the highest achievement award at the county level and is a position awarded annually. Similarly, the capstone award in Texas 4-H is the Gold Star Award, which is given to Seniors who have shown outstanding leadership and proficiency in their project areas. In Virginia, on the other hand, All-Stars are not simply those who have achieved an All-Star award, but are those who have gained membership into the Virginia All-Stars organization. Upon reaching the age of 15, 4-H members are eligible to apply for membership into the All-Stars organization, which promotes the continuation of 4-H principles. Many conferences are held at various levels of the 4-H program for youth and adults. The National 4-H Conference, held at National 4-H Youth Conference Center is the USDA Secretary's premier youth development opportunity to engage youth in developing recommendations for the 4-H Youth Development Program. The National 4-H Congress is an annual educational conference that brings together 4-H delegates between the ages of 14 and 19 from across America to share cultural experiences and discuss important issues facing youth. This five-day event is typically held during the weekend of Thanksgiving and has been hosted in Atlanta, Georgia, since 1998. Throughout the conference, 4-H delegates attend numerous workshops, participate in community service activities, and listen to speakers in an effort to develop compassion and increase social awareness. Citizenship Washington Focus is a week-long conference offered for high school-aged students. At the conference, students have the opportunity to learn how to be citizen leaders in their communities. Throughout the week in Washington, D.C., participants visit monuments, meet with members of Congress, and develop communication, leadership and citizenship skills. Other conferences are held by regional and state entities for youth, for volunteer development, or for professional development for staff. For many years, use of Native American names and certain themed activities was part of the summer camping programs of some eastern states. However, this practice was deemed offensive and protests were raised. A complaint to the U.S. Department of Agriculture's Office of Civil Rights in 2002 and an ensuing investigation that threatened to cut off funds to the state's program prompted the West Virginia University Extension Service to abandon offensive and stereotypic practices such as face-painting, and use of imagery not a part of the culture of local Native people, such as tepees and totem poles, They also eliminated the practice of having children wear feather headdresses, and stopped having campers engage in "stereotypical motions and dances," including chanting "Ugh! Ugh! Ugh!". However, the state program deemed the dividing of campers into groups, called "tribes" named after actual Indian Nations, to be respectful and acceptable. That same year, the Virginia Extension Service removed all references to symbols or camp "traditions" related to Native Americans, including the decades-long practice of dividing campers into "tribes" using names of nations considered native to Virginia, replacing the group names with animal names. Participation in 4-H events and activities, the value of projects completed and the challenges and responsibilities experienced in 4-H have contributed to the personal and leadership development of some 4-H alumni. A majority of 168 alumni surveyed in Pennsylvania feel that 4-H experiences have also significantly contributed to their success in the workforce and that the knowledge and skills gained through 4-H continue to benefit them in their adult lives. ^ a b "The California 4-H Youth Development Program - Directions for the Decade Ahead" (PDF). Winter 2003. Retrieved 2010-06-07. ^ "4-H Structure". 4-H Canada. Archived from the original on 15 May 2015. Retrieved 8 May 2015. ^ "4-H Around the World". 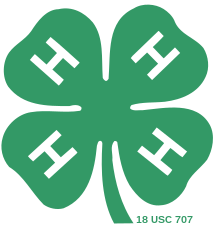 4-H (USA). Retrieved 8 May 2015. ^ Kewaunee Enterprise, February 26, 1941, "Death Takes Prof. Moore"
^ a b The Father of Wisconsin 4-H. The Ransom Asa Moore Story, Author: Gleason, Marjorie and William, Publication: 1989 Accurate Publishing & Printing Inc.
^ Rettig, Patricia. "Guide to the Records of the Colorado 4-H". lib2.colostate.edu. ^ "Compilation of early correspondence and publications related to Boys' and Girls' Club Work produced by the United States Department of Agriculture". National Agricultural Library Digital Repository. Archived from the original on 14 June 2010. Retrieved 7 June 2010. ^ Journal of Research in Childhood Education. "Cooperative and Competitive Orientations in 4-H and Non-4-H Children". Retrieved 2012-03-28. ^ a b Reck, Franklin A. (1951). The 4-H Story: A History of 4-H Club Work (PDF). Chicago, IL: National 4-H Service Committee. pp. 166–168, 210. OCLC 950057521. ^ Benson, Oscar Herman; Warren, Gertrude L. (February 1920). Organization and Results of Boys' and Girls' Club Work (Northern and Western States): 1918. Washington, DC: U.S. Department of Agriculture. Retrieved 21 August 2018. ^ "4-H Detailed History". College of Agriculture and Life Sciences, University of Arizona. Archived from the original on 2010-06-19. Retrieved 2010-06-07. ^ "Folks Who Helped Make 4-H Great: Gertrude Warren". National 4-H History Preservation Program. 8 March 2016. Retrieved 8 August 2018. ^ "4-h Pledge". 4-H. Retrieved 6 November 2018. 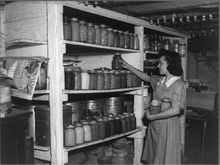 ^ "Elsie Carper Collection on Extension Service, Home Economics, and 4-H". National Agricultural Library. Archived from the original on 2010-04-14. Retrieved 2010-06-07. ^ "U.S. House of Representatives, 18 USC Sec. 707, 4-H club emblem fraudulently used". Office of the Law Revision Counsel. Archived from the original on 2012-03-03. Retrieved 2010-06-07. ^ "Using the 4-H Name and Emblem" (PDF). Archived from the original (PDF) on 28 May 2010. Retrieved 7 June 2010. ^ The Journal of Extension (JOE). "Volunteer Management Needs Assessment of the Tennessee 4-H Program". The Journal of Extension. Retrieved 2012-03-28. ^ The Journal of Extension (JOE). "Relationships Between 4-H Volunteer Leader Competencies and Skills Youth Learn in 4-H Programs". The Journal of Extension. Retrieved 2012-03-28. ^ Child Study Journal. "Building Life Skills through Afterschool Participation in Experimental and Cooperative Learning". Retrieved 2012-03-28. ^ Betler, Bruce. "Camp Good Luck". West Virginia Encyclopedia. West Virginia Humanities Council. Retrieved March 20, 2017. ^ The Journal of Extension (JOE). "Programming Parameters for 5-to-8-Year-Old Children in 4-H". The Journal of Extension. Retrieved 2010-06-07. ^ "West Virginia 4-H All Star History". West Virginia 4-H All Star Website. Archived from the original on 2009-06-24. Retrieved 2010-06-07. ^ "4-H All Star California". University of California 4-H Youth Development Program. Archived from the original on June 20, 2009. Retrieved 2010-06-07. ^ "Texas Gold Star Award Application" (PDF). Archived from the original (PDF) on March 25, 2009. Retrieved 2010-06-07. ^ Virginia 4-H "All-Star Brochure" Archived 2007-02-07 at the Wayback Machine by the Virginia Cooperative Extension. ^ "4-H National Headquarters - 4-H Conference and Congress". National4-hheadquarters.gov. 22 July 2009. Archived from the original on 7 June 2010. Retrieved 7 June 2010. ^ "About National 4-H Congress". National 4-H Congress. Archived from the original on July 14, 2011. Retrieved 2010-06-07. ^ "Citizenship Washington Focus". 4-H.
^ "National 4-H Dairy Conference". Wisconsin 4-H Youth Development. Archived from the original on 2011-10-10. Retrieved 2012-03-01. ^ "Eastern National 4-H Horse Roundup". Eastern National 4-H Roundup. Retrieved 2012-03-01. ^ "Western National 4-H Horse Roundup". Western National 4-H Roundup. Retrieved 2012-03-01. ^ "National 4-H Shooting Sports Invitational Match Results". 4-H Shooting Sports. Retrieved 2012-03-01. ^ a b Washington, The (2002-06-25). ""Administration probes 4-H Indian themes" Washington Times, June 25, 2002". Washingtontimes.com. Retrieved 2013-11-28. Buck, Holly (2004). "'Amusements and Recreations... Makes Our Working Hours Profitable': Utah 4- H, 1940-1960". Utah Historical Quarterly. 72 (1): 69–84. doi:10.1093/whq/35.3.409. Holt, Marilyn Irvin (1992). "From Better Babies to 4-H: A Look at Rural America". Prologue: The Journal of the National Archives. 24 (3): 245–255. Holt, Marilyn Irvin. Linoleum, Better Babies, and the Modern Farm Woman, 1890-1930 (U of New Mexico Press, 1995). Keathley, Clarence R; Ham, Donna M. (1979). "4-H Club Work in Missouri". Missouri Historical Review. 51 (1): 209–220. Wessel, Thomas R. and Marilyn Wessel. 4-H: An American Idea, 1900-1980: A History of 4-H (Chevy Chase, MD: 4-H National Council, 1982). 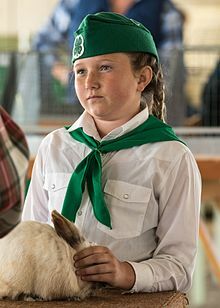 Wikimedia Commons has media related to 4-H.